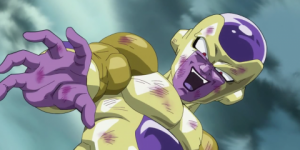 Thanks to the latest trailer for Dragon Ball 2015 we have our first look at Frieza’s new final final form. The new form is in the same taste as Goku’s God mode where he is similar to his old form but has a bit of a different color scheme. Compared to when Dragon Ball Battle of Gods came out in 2012 the studio are much better prepared. Where as before the only merchandise we really saw was KFC cups and some statues. For the Return of Frieza they have already launched a new game with Dragon Ball Xenoverse. The anime also has a manga to accompany it. There are also teases of Figuarts toys in the making.